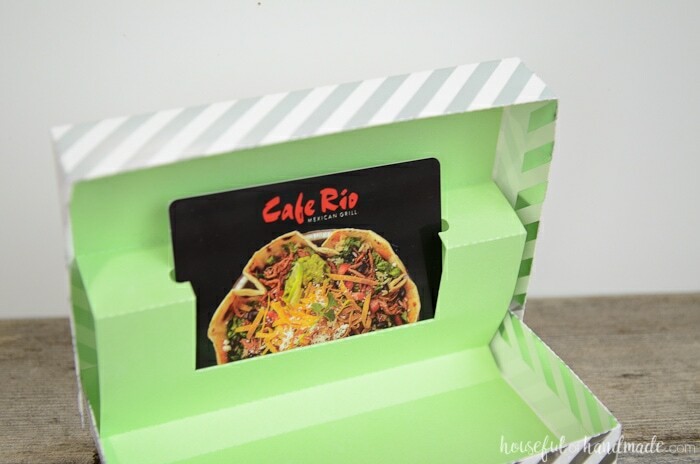 A gift card box is the perfect way to wrap a gift card. Don’t let it get lost under the tree in a tiny gift card envelope, instead make a statement with these unique gift card holders. 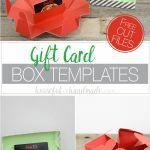 If you are giving gift cards this Christmas, you are going to love these gift card box templates. 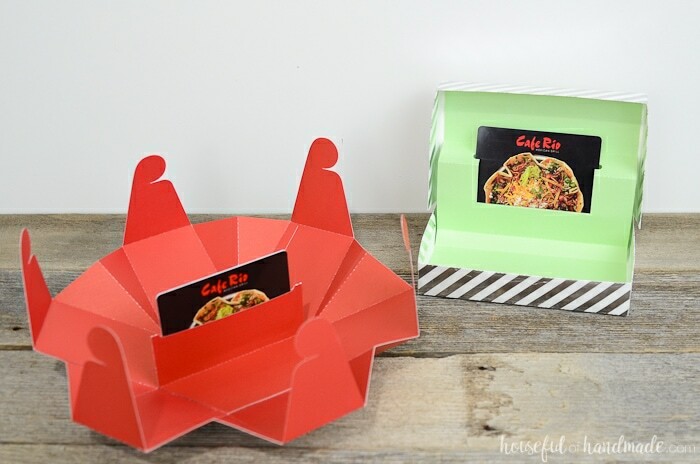 Make a gift card holder that looks like the perfect present. No need to worry about the gift card envelope getting lost in the craziness of Christmas morning. And they are super easy to make with the cut files and templates! As I was finishing up the last minute gift wrapping (at least for all the gifts that are done, still DIYing a couple things), I decided I wanted a better way to wrap up the gift cards we are giving. Gift cards are a great gift, but those tiny envelopes just look so sad under tree. 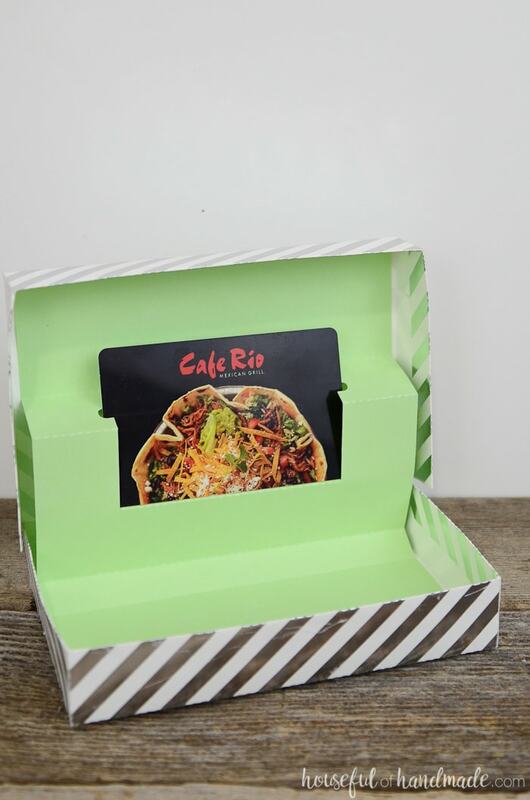 I wanted a cute little gift card box that would make those gift cards look as special as they are! I mean who doesn’t like to receive money for Christmas?! The first one I made is a pretty standard gift card box, but of course I jazzed it up with some sparkly scrapbook paper. Then a quick tie with some twine and it’s the perfect way to wrap a gift card. And this box is so easy to put together!!! It’s easier than wrapping an irregular box (or those kids toys that have open fronts on the boxes, I hate wrapping them!). But I also had an idea for another style of gift card box. One that would fall open and reveal the pop-up gift card inside. This gift card holder almost didn’t happen. The top of the box was giving me oh, so many issues. I used up about 12 sheets of paper cutting, redesigning, and cutting again. It was late last night and I almost gave up. Luckily, I didn’t have to wake up early this morning and I persisted! They say 3rd times a charm, but this one took me 6 tries. 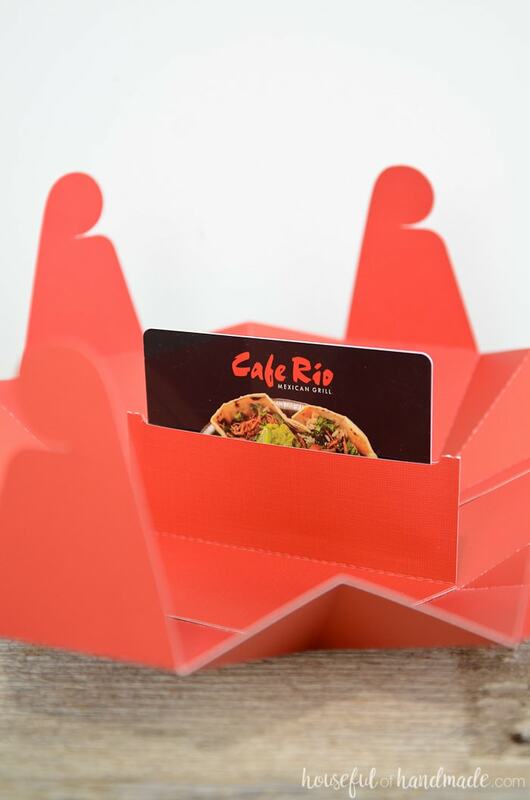 It was worth it because the gift card box opens like a flower to reveal the prize inside. And it too is easy to make (now that I have it figured out). You can leave the box as is, add a cute little tag or bow. But I can’t wait to see how it is opened up in a few days! 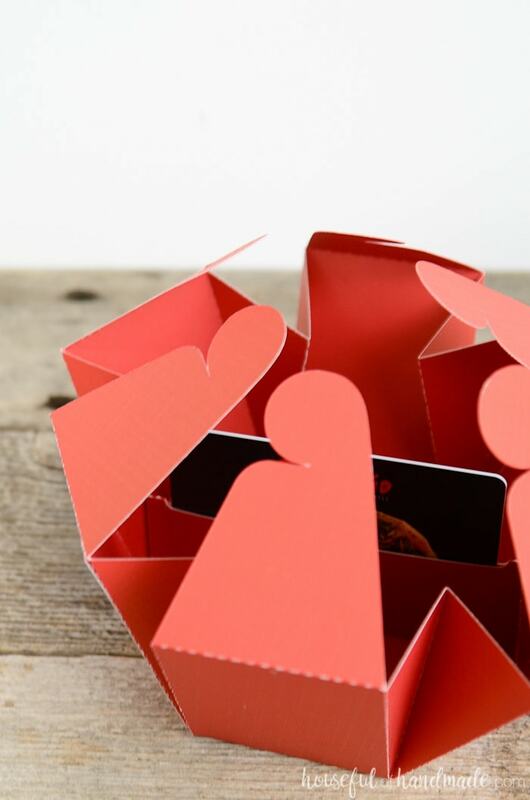 So finish up that last minute wrapping with these amazing gift card box templates. Click the arrow below for the complete tutorial. 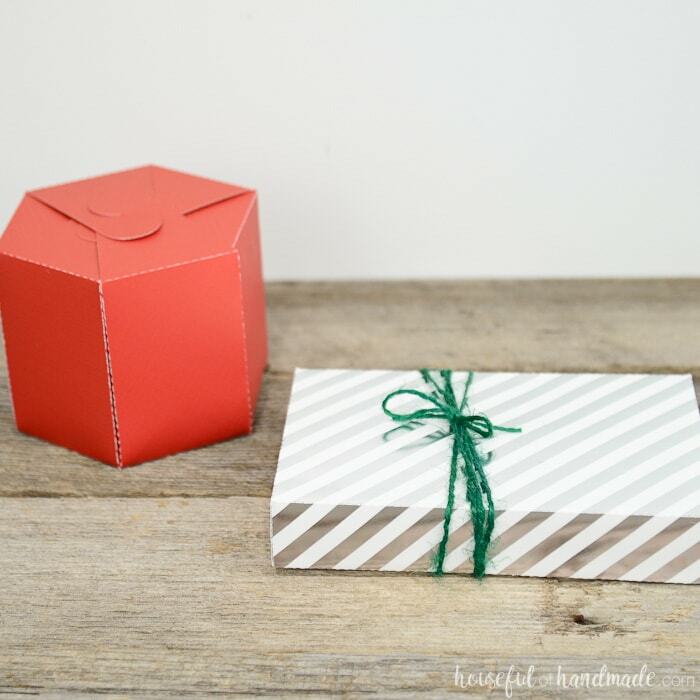 And if you are doing last minute baking gifts, check out this easy cookie gift box DIY too! Such cute gift boxes but I seem to be having difficulty finding the prompt to get the download. So confused. The download is in the subscriber library. Click here to subscribe to the weekly newsletter, then you will receive an email with the link and password. In the library you will see pictures of all the downloads and you can click the words below those pictures to download the ones you need. Hope this helps, if not, please send me and email and I will help you get them! Thank you for these! I made one of each design, and I used the hexagon gift box to hold cash 🙂 Merry Christmas! Love the cash idea! I will definitely be using that in the future. Have a Merry Christmas!